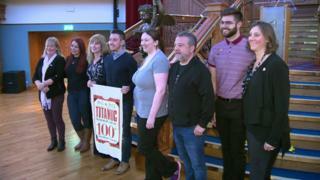 More than 100 relatives of passengers who were on board the Titanic gathered in Belfast on Friday to mark the 105th anniversary of its sinking. The event was held in Belfast's Titanic Centre, which is situated near the spot where the ship was built. The Titanic sunk on 15 April 1912 during its maiden voyage. More than 1,500 people died. The event was organised by the great-grandson of the man who was at the helm when the ship struck an iceberg. Simon Medhurst, a long-time collector of Titanic memorabilia, said he only found out that he was related to Robert Hichens, one of the ship's quartermasters, after meeting his birth father in 2012. "It was a complete turnaround for my life, really, from collecting to suddenly being somebody who is connected to the Titanic," he said. Simon explained that Friday's event had taken two years to organise. "I wasn't sure if it would just be our family that turned up, but actually it's been phenomenal to see relatives and enthusiasts. People just love the story of the Titanic. "I think the importance of this type of gathering is in that it is easy to forget that there were those who lost their lives." He added: "It affected families right the way through so even though there are those here who have stories about survivors, there are others who lost relatives. "But they are able to tell their story and they're not forgotten, that's the important thing." The event also allowed items to emerge that illuminated more of Titanic's history. Beverly Roberts brought a purse handed down through generations of her family that her great-grandmother carried on the voyage. She said the event allowed relatives to explore surprising connections. "Every time I meet somebody new, I find out something new," she added. "I've got a relative here today that I've never met before." Robert Shields, whose grandmother's brother was the ship's lift operator, said he had met his third cousin, Jan Jarvis, for the first time. "It's amazing, all the stories coming together," he said. "I think events like these are very important and I hope they continue for a long while."